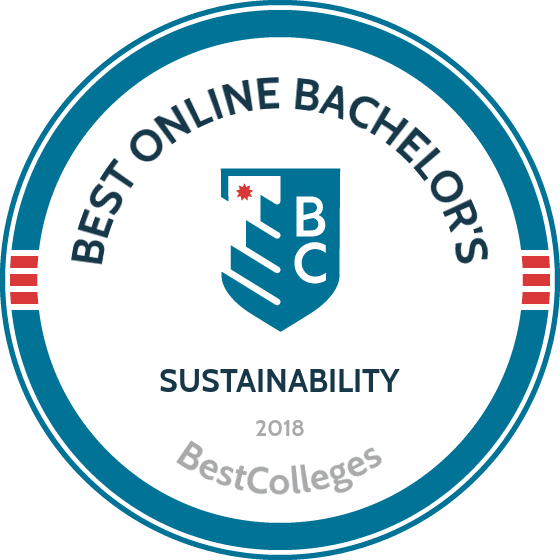 What Are The Best Online Sustainability Degree Programs? What Will I Learn in an Online Bachelor's in Sustainability? The field of sustainability spans many industries, including business, engineering, science, and government policy. Whatever your career interest, they are likely considering how to make their field more sustainable. A sustainability degree online prepares you to improve processes that help the environment and society, while also teaching you economics, analysis, problem-solving, and how to apply classroom knowledge to real-world scenarios. Accordingly, careers in sustainability are projected to grow at above-average rates over the next decade. The Bureau of Labor Statistics projects employment of environmental scientists and specialists to grow 11%, and employment of environmental engineers to grow 12%. If you're interested in careers that improve environmental quality, check out our guide to bachelor's degrees in this dynamic field. Students passionate about managing resources for future generations should consider an online sustainability degree from Oregon State University (OSU). Oregon State in Corvallis, OR offers a bachelor of science in sustainability that prepares students to address issues such as climate change, and responsible management of clean air, water, and energy. This unique sustainability online bachelor's degree complements OSU's other degree programs and is only available as a double degree. Students earn 180 credits in another subject areas before completing an additional 36 credits in sustainability courses, electives, and a required practicum. Applicants may transfer some degree requirements from another institution, however, they must complete a minimum of 45 credits at OSU. Upon completing this sustainability degree online, students earn two bachelor's degrees: one in their primary major and the other in sustainability, opening doors for graduates in some of today's most in-demand fields in the public and private sectors. The University of Wisconsin-Stout is Wisconsin's Polytechnic University, offering career-focused degree programs that blend applied learning with a liberal arts education. The bachelor of science in sustainable management is a fully online multidisciplinary program teaching students to balance environmental and business needs, while protecting natural resources for future generations. Four UW campuses combine resources to offer the sustainability online bachelor's degree. National corporations who are leaders in sustainability developed the program's real-world curriculum. UW-Stout's online sustainable management program is a 21-course, 63-credit degree completion program ideal for working professionals. The flexible course offerings allow students to take classes at their own pace. Those with an associate degree or those who have completed two years of their bachelor's program may apply directly. Learners who need to complete general education requirements can do so online through UW-Stout. Founded in 1874, the University of Wisconsin-River Falls is part of the prestigious University of Wisconsin education system, a short distance from Minneapolis-St. Paul. Together with three other UW campuses, UWRF offers the fully online bachelor of science in sustainable management, developing best practices for companies interested in sustainability. This online sustainability degree is designed as a degree completion program for those with an associate degree. UWRF does not require campus visits or face-to-face meetings, and online learners can begin their program anytime on a full- or part-time basis. The 63-credit, 21-course sustainability online bachelor's degree includes a capstone course typically completed in the last semester. Transfer applicants must have an associate degree or previous college credit and a cumulative 2.0 GPA. Applicants should consult with a UWRF advisor to determine how many transferable college credits may apply to their degree plan. Those with an interest in managing and protecting the earth's natural resources will find Prescott College’s bachelor of arts in environmental studies and sustainability program a suitable choice. The program is taught in a hybrid format, blending classes online with work in the community under the mentorship of faculty advisors. The degree is part of Prescott's limited residency program, which requires learners to attend new student orientation on campus. The environmental studies and sustainability program features two tracks. The sustainable community development track provides a thorough understanding of the ecological, psychological, social, spiritual, and physical dynamics within communities. Students conduct community-based research and outreach. The environmental studies track focuses on environmental education, agro-ecology, environmental policy, and natural history. Learners gain practical knowledge in biological and earth sciences, resource management, environmental policymaking, and field research methods. Students must complete 120 semester credits to earn a bachelor's degree, 60 of which are in the major. Roosevelt University's bachelor of arts in sustainability studies prepares graduates to address sustainability issues impacting today's world. The sustainability bachelor's degree completion program is the first of its kind in the Chicago area, and is Roosevelt's first program for students age 22 and over. The program allows adult learners to maintain a work-life balance while earning an undergraduate degree at an accelerated pace. Students have the flexibility to attend classes in the way that works best for them: fully online, on campus, or on a hybrid schedule that combines online coursework with face-to-face meetings. The curriculum delves into the sustainability issues challenging communities today, such as energy and climate change, transportation and planning, and biodiversity. Students put their knowledge to work through hands-on community-based learning, field trips, and campus sustainability projects. Adult learners complete 24 credits in the major, with at least 15 credits required at Roosevelt. An online bachelor's degree in sustainability is usually 120 credits of coursework, which involves a combination of general education and major courses. While programs differ, students often complete courses in economics, ecology, and math before moving into courses focused on sustainability. Students in these courses analyze problems through the lens of a triple bottom line: strong profits, a strong environment, and strong communities. Environmental Science: Often one of the first courses required in a sustainability program, this course tackles several core subjects like basic ecological ideas, and how humans affect the environment. The curriculum explores how sustainable practices offset human impact on the environment. This course is relevant to all practitioners, from engineers to consultants. Systems Thinking: Sustainability graduates are often in demand because of their grasp of systems thinking. In other words, they understand the links and interactions that comprise systems. In these online sustainability online degree programs, students use systems thinking to analyze problems and apply sustainability practices to business and scientific issues. Economics of Sustainability: Students complete basic economics or algebra courses before moving into the economics of sustainability, which covers macroeconomics, microeconomics, and the application of these principles to environmental goods and services. Contemporary economic issues are also analyzed using systems thinking. This course is essential for sustainability managers and consultants to show the economic benefits of incorporating sustainability. Environmental Policy: This course explores the history, role of government, and influencers of environmental policy. Students also learn about the issues facing sustainable policy initiatives and the processes to implement those new initiatives. Sustainability Capstone: Often completed in the final year or semester of the program, the sustainability capstone is an opportunity for students to apply what they have learned to a real-world scenarios, often by working directly with an organization to help them solve a sustainability problem. This course is particularly useful for future consultants and managers with similar duties in their careers. It is important that students ensure any college or university they attend is accredited, including those offering online programs. The Department of Education (ED) recognizes seven regional accrediting agencies, and these agencies ensure that colleges meet certain standards. The ED also recognizes national accrediting agencies, and these generally oversee career schools, training colleges, and other specialized institutions across the country. While nationally accredited schools may be less expensive, it is usually easier to transfer credits earned at a regionally-accredited college. Graduate programs often require students to have earned a bachelor's degree at a regionally-accredited institution, as well. In addition to the ED, the Council for Higher Education Accreditation (CHEA) also recognizes accrediting agencies. The ED and CHEA monitor accrediting agencies to prevent anyone from declaring themselves an accrediting agency. If a college is not accredited by a recognized regional or national accrediting agency, they cannot offer federally-funded aid to students. Even though it is not required, many accrediting agencies also apply for CHEA evaluation. The EDs website provides a list of accredited colleges and universities, and students should ensure their prospective institution is listed. With an increased interest in sustainability across industries, graduates with sustainability online bachelor's degrees are prepared for careers related to the environment, engineering, or business. Businesses are increasingly interested in their social responsibility -- and the improved profits that sustainability can bring -- leading them to work with consultants and managers that specialize in sustainability. Some companies even appoint top executives who are singularly focused on a corporate sustainability strategy. A degree in sustainability can also lead to influencing public policy, designing solar energy systems, and improving public health. These top executives enact and oversee corporate sustainability strategy, which includes addressing issues like energy use, waste elimination, and building design at a specific business or corporation. According to ONET Online, other job titles include Director of Sustainability, Vice President of Corporate Social Responsibility, and Sustainability. Environmental scientists and specialists work in a variety of areas, including advising policymakers, working with industries to reduce waste, or studying the effect of certain chemicals on the ecosystem. This occupation is expected to grow at a rate of 11% -- faster than average -- between 2014 and 2024. More commonly known as supply chain coordinators, logisticians analyze and coordinate a supply chain. They manage a product from distribution through delivery to the consumer. For sustainability graduates, a career in sustainable supply chain management may be desirable, as logisticians are needed in every industry. Half of all logisticians are employed in manufacturing or the federal government. Similar to management analysts, these consultants advise businesses and companies on improving their sustainability practices in order to make the corporation more environmentally efficient and profitable. Sustainability consultants often work for private firms, and one in five are self-employed. Consultants and analysts travel frequently to meet with clients. For those wanting to develop solutions to environmental problems -- including efforts to improve recycling, public health, and air pollution -- a career as an environmental engineer could be a good fit. Similar occupations include energy analysts, solar systems designers, and wind turbine technicians. Almost all positions in sustainability require a bachelor's degree. The number of jobs in this field is constantly growing; the Bureau of Labor Statistics estimates that the employment of environmental engineers is expected to grow 12% over the next decade. While salaries vary, almost all are above the Bureau of Labor Statistics May 2016 median wage for all occupations of $37,040 per year. Students pursuing an online sustainability degree have several options for financing their education, including federal financial aid and work study, scholarships, grants, and loans. All students should complete the Free Application for Federal Student Aid (FAFSA) to determine their eligibility for federal financial aid and work study programs. The FAFSA may also be required by some universities for scholarship consideration. Some sustainability programs also offer program-specific grants, which have been donated by businesses and individuals with a commitment to the field. Additionally, students should investigate other “green scholarships”, which are generally reserved for students majoring in the natural sciences, environmental studies, or sustainability.